What a nice man. I love that you had such a good visit with someone that interesting. I bet he enjoyed those eggs. When I said organic fresh eggs, he was over like a shot. With the gorgeous organic garden he had, I can tell he appreciated the organic fresh eggs, too. I'd love to see his garden...very interesting! I would love to see it tool. I'll have to ask the young couple he was visiting if they have ever seen it. It would make a good photo subject for you. He said the garden had been featured in several publications. Sounds like he created the perfect spot for himself. You never know indeed, could run into a nutcase or someone you can learn things from. I wasn't wary of this young man because I know the young couple he was visiting. We only have one certified nutcase in the neighborhood and he writes big scary things on the front of his house with spray paint. Another neighbor told me yesterday that the nutcase was just on the local news. I guess a lot of people had been driving by to see this. I think he's a Vietnam vet and here's a good example of the gov't not helping our vets. Everyone has told the authorities about him but nothing has been done. I did talk to him this summer when he was in a lucid moment. I've talked to the surrounding neighbors about him but the authorities don't seem to step in. What to do? Ugg ,a situation where they won't step in until something really bad happens. I'd love to see pictures of it! And you are so right, you never know a person's story until you talk to them. Everyone has one and most are very interesting. I guess I offered the right person organic eggs. This young man was extremely "earth centered." He had 2 short videos in his phone and I just watched with my mouth open. I wasn't expecting anything like this. It was a very nice encounter. Hi Manzanita - what a wonderful turn of events .. how interesting .. and he had time for you - I sincerely hope he visits again soon ... sounds very fascinating. I agree with Bish .. as for some photos and let us see ... ?! He said the garden was featured in some publications. I can understand why. I'm going to ask the couple he was visiting if they ever saw his garden. One would have to be young and strong to take on a project like that. It was just a house it was built over and I would think the roof would have to have heavy reinforcement in able to support that weight because during a storm, a tree fell on another neighbors roof and crashed a huge hole in the roof. I'll just bet when he got home he was telling people about the wonderful person HE met. I agree with Al's comment above!! Do I have to say it TWICE? Into my life a little spice. I think he left that day. I'll ask the neighbors if they ever saw his garden. Al wrote my thoughts also. What a really neat guy you met and I do hope you meet again before he goes back home to that garden in the sky. Don't suppose he is a blogger? Wouldn't that be cool. Thank you. I'll have to ask the neighbors exactly where I could find the publications of his garden. I can understand gardens in a commercial building but then I think of all the work to have one on top of an ordinary house. I've seen movies and read novels where people had such gardens, lush and wild and productive. Only once was the reinforcing of the building structure mentioned and I've never forgotten that, in case I ever want to build one. I've wondered about the watering too, specialised drains would be necessary to ensure no leakage into the building below. Oh yeah.... I nver thought of the water situation and leakage .That could be a big project all in itself. If the house was built with a roof garden in mind, it would seem easier but to add it to an ordinary house would take a lot of engineering. I remember he said, he had wanted a garden but didn't have the land, so he made his land....... but it would be very interesting to see in the real. I think you're a magnet for these sorts of conversations. Love ya Manzi! young men who will take the time to talk to an older person. As I've said before, when one gets old, they become invisible to so many young people. It's true! I often think hardship brings blessings and we have a hard time realizing that while facing the rough patches. Here's to new friends, good deeds and pleasant surprises! Very interesting encounter with an enterprising young man. In my own city there are people who have vegetable gardens on their terraces because vacant spaces are becoming rare and building are everywhere. Besides, organic farming is becoming the watch word and many people would like to grow their own vegetables. Buying from the market is becoming risky because fruit and vegetables grown for public consumption are full of fertilizers and pesticides. Wise people in your community, growing vegetables on their terraces. The farmers markets here, are supposed to be all organic but I have a feeling, much of it isn't. Even planting the vegetables outdoors is a sitting-duck for the stuff flowing out of the chemtrails. Are you plagued with the chemtrails too? I can't believe the people here, voted down labeling the organic food. That has to be political because everyone knows (or should know) of the health benefits from organic food. GMO's have been going on a long time AND there are so many new, crazy diseases that are not recognized by allopathic doctors. Thanks for the meaningful comment and I do hope that you have a good honest source for your produce. Wishing you all the pleasantries of life. out of the rhyming mood. Hahaha. Rhyming is fun, isnt it? What a nice story. Nice people like that give me hope for the rest of 'em. too often we have to "look" for them. I hope you are having a ball with your new blog. Gary from California... sounds like a great guy. Oh how I love gardens, especially fairy tale gardens. 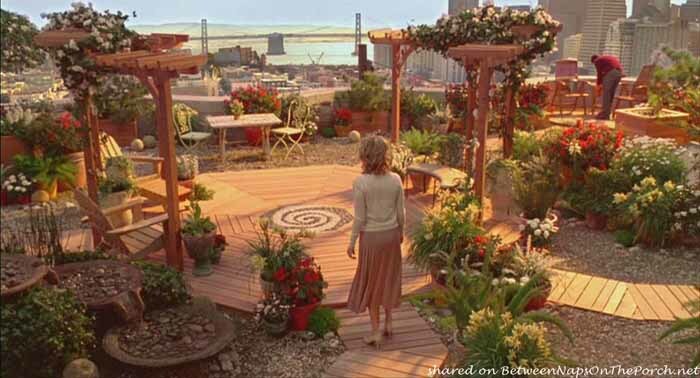 Here's my favorite roof top garden from the movie Just Like Heaven: CLICK! for sending it. You have made my early day, already. I shall go back and study the picture some more and revel in the warm glow it give me in the tummy. What a delightful surprise ....... it's daisyb. Wow! I've always admired people who are able to garden in the city on top of a roof of a building. I can barely do it on the ground. It feels great to be able to visit again after being so busy. I'm in between projects now and before guests start arriving again.